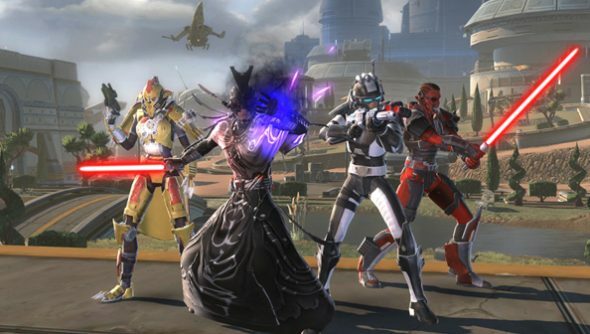 The thing about SWTOR’s ongoing free-to-play revival is this: while many justifiably don’t feel like celebrating when a number of punitive systems remain in place, it really has revitalised the game. Two million have joined since its relaunch in Autumn, and thousands more go through the rigmarole of account creation and a many-gig download with every passing day. In a State of the Game update today, executive producer Jeff Hickman addressed the questions BioWare Austin are frequently asked to field about the success of their free-to-play option. “We’re now about 120 days post-launch and more than 5 months into our new series of content updates, so we’re just starting to get a feel for it ourselves,” he wrote. Then free-to-play happened. The frequency of content updates was increased, and non-subscribers were able to play through all class stories through to level 50, provided they could stomach a reduced XP rate, truncated quickbars and a host of other restrictions. The move has paid dividends, says Hickman. “You can see for yourself when you log in to the game,” he wrote. “Our new, high capacity servers are teeming with people. This means more people to play with, more growth for your guilds, more Warzone matches, and more ways for players to continue to advance their characters. I’m not sure Hickman is wise to dismiss the sort of criticism SWTOR’s free-to-play option has weathered as an inevitability of the genre – other contemporaries, notably the MMOs under the custody of Turbine, have made the transition without inciting nearly as much frustration from new players. “We hear you on features such as hood toggle (as one example of many), Asia Pacific server populations (we are actively looking into solutions that make the most sense given our current tech and should have an announcement soon), continued improvement to the Cartel Market pricing and content, and the need to keep working on performance improvements and bugs,” said Hickman. As a current player, I can believe it. Last week’s SWTOR 1.7.2 patch proved to be the most significant in a long line of tweaks that have reduced the experiential gap between free and Preferred players and their subscriber brethren. Though they’re loathe to say as much, BioWare are working to curb the worst excesses of their redesign. Have you picked up SWTOR post-free-to-play? And have you stuck at it?